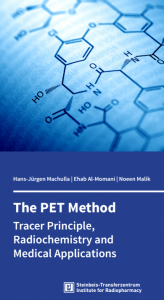 Together with Ehab Al-Momani and Noeen Malik, I have recently published a book that covers important aspects of the PET Method. The book is available in print (alternatively from Amazon) and as an ebook and is published by Steinbeis Edition, Stuttgart, Germany. Beside CT and MRT, Positron-Emission-Tomography (PET) is one of the Molecular Imaging Modalities. PET scans are obtained by registration of gamma radiation resulting from the annihilisation of the positronium in form of two gamma-photons in an angle of 180° from point of origion. Primarily, PET registers a physical signal, but the radionuclide emitting the gamma radiation is incorporated into molecule following the metabolic turn-over of to be studied as it is based in the particular biochemical concept. That is the way in which the PET signal is directly correlated to the metabolic pathway to be assessed. Therefore, specificity and selectivity of the PET measurement are defined by the radiopharmaceutical concept of the particular tracer (radiopharmaceutical). Thus, PET is more than just an imaging procedure, it is a method for assay of metabolic functions. The PET method, indeed, has a unique role and no alternatives exist. Best examples are the assay of energy metabolism in tumors by FDG, DNA synthesis by FLT and functions of receptors in the dompanergic, serotonergic or opioid systems. validation of the radioactively labelled compound in cells, animal models and patients, aiming at the assessement of pathological alterations and strategies in therapies. in addition the direct perspectives are presented as already proven, yet not medically applied.